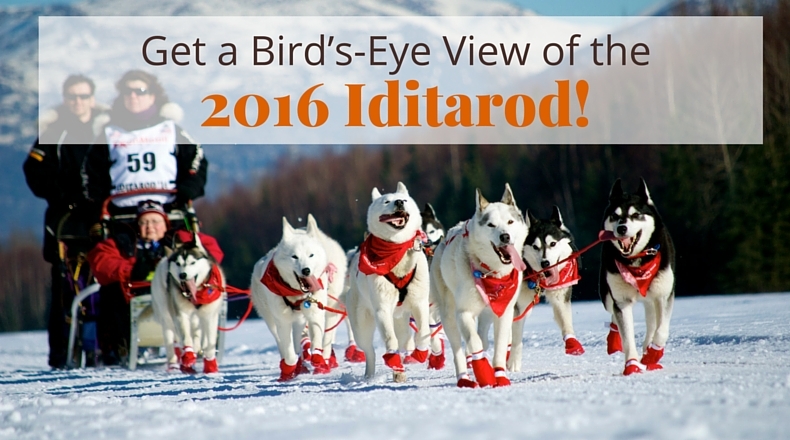 Get a Bird’s-Eye View of the 2016 Iditarod! The Iditarod is an endurance race built on pure adrenaline. Every year in March, mushers and their dog teams race from Anchorage to Nome. Extending more than 1,000 miles, race teams traverse some of the roughest, toughest terrain found in nature, from mountain ranges to desolate tundra to windswept coastlines. This year, the Iditarod Ceremonial Start takes place in the heart of Anchorage, Alaska. The race kicks off on Saturday, March 5, 2016 at 10 a.m. It’s centered at Fourth Avenue, which offers some of the best race start vantage points. After mushers and dogs begin their trek, there’s still plenty of action to be had The Lakefront in Anchorage, which offers pre- and post-race festivities for all ages. Looking for a new way to observe the race action? Travel by helicopter to Safety, the last checkpoint on the Iditarod race trail. Our Iditarod Flightseeing Tour offers a fun way to see mushers and their four-legged athletes in action as they head eastbound to their final destination: Nome. Take a 30-minute break in Safety for a chance to meet them, take some pictures, and grab a drink or snack from the bar. Redeem Your PFD Special Coupons! If you purchased our 2015 PFD Coupons, traveling to the 2016 Iditarod Race is a great opportunity to use them! Coupons can be used towards one way or roundtrip tickets and are valid for travel through January 10, 2017. Contact customer service to apply your coupons to your airfare. The Gold Points program is the best way to receive discounted or free tickets. Every time you fly, you earn 5 Gold Points. The more you earn, the more you save! Check out all the available rewards here. Will you be attending this year’s Iditarod Trail Sled Dog Race? What part of the race are you looking forward to the most? Share your thoughts with us in the comments!